The first two editions of Tenso Europe Chamber Choir (TECC) summer school took place in Sigulda (Latvia). After two years of enjoying the Latvian summer, the project took place in Ede, the Netherlands. 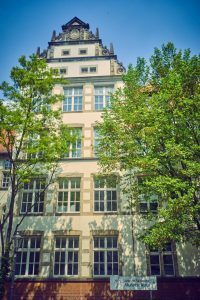 The 2016 edition of Tenso Europe Chamber Choir took place at the wonderful Joseph-Schmidt-Musikschule in the Berlin district of Köpenick. Above a photo of the hall where rehearsals and the try out concert were located.